As the result of extensive validation, the antibody HDAC1 has been upgraded to Premium category. Please, find it as HDAC1 polyclonal antibody - Premium (C15410325). Polyclonal antibody raised in rabbit against the C-terminal region of human HDAC1 (Histone deacetylase 1), using a KLH-conjugated synthetic peptide. ChIP was performed with the Diagenode antibody against HDAC1 (Cat. No. C15410053) on sheared chromatin from 4,000,000 HeLa cells. An antibody titration consisting of 1, 2, 5 and 10 μg per ChIP experiment was analysed. IgG (2 μg/IP) was used as negative IP control. QPCR was performed with primers specific for the EIF4A2 and GAPDH promoters, used as positive controls, and for the MYOD1 gene and Sat2 satellite repeat, used as negative controls. Figure 1 shows the recovery, expressed as a % of input (the relative amount of immunoprecipitated DNA compared to input DNA after qPCR analysis). 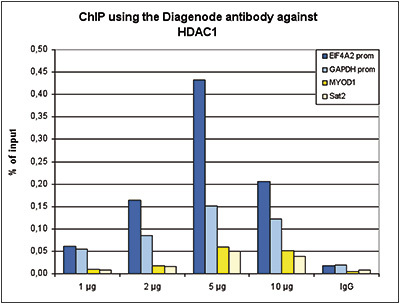 ChIP was performed on sheared chromatin from 4,000,000 HeLa cells using 2 μg of the Diagenode antibody against HDAC1 (Cat. No. C15410053) as described above. The IP’d DNA was subsequently analysed on an Illumina HiSeq 2000. Library preparation, cluster generation and sequencing were performed according to the manufacturer’s instructions. The 50 bp tags were aligned to the human genome using the BWA algorithm. Figure 2 shows the peak distribution along the complete sequence and a 1 Mb region of the X-chromosome (figure 2A and B) and in two regions surrounding the GAPDH and EIF4A2 positive control genes, respectively (figure 2C and D). 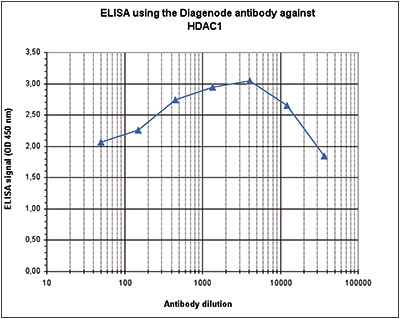 To determine the titer of the antibody, an ELISA was performed using a serial dilution of Diagenode antibody directed against HDAC1 (Cat. No. pAb-053-050), crude serum and flow through. The plates were coated with the peptide used for immunization of the rabbit. By plotting the absorbance against the antibody dilution (Figure 2), the titer of the antibody was estimated to be 1:75,000. Whole cell extracts (25 μg, lane 1) and nuclear extracts (25 μg, lane 2) from HeLa cells were analysed by Western blot using the Diagenode antibody against HDAC1 (Cat. No. pAb-053-050) diluted 1:1,000 in TBS-Tween containing 5% skimmed milk. The position of the protein of interest is indicated on the right (expected size: 55 kDa); the marker (in kDa) is shown on the left. HeLa cells were stained with the Diagenode antibody against HDAC1 (Cat. No. C15410053) and with DAPI. Cells were fixed with 4% formaldehyde for 10’ and blocked with PBS/TX-100 containing 5% normal goat serum and 1% BSA. The cells were immunofluorescently labelled with the HDAC1 antibody (left) diluted 1:500 in blocking solution followed by an anti-rabbit antibody conjugated to Alexa488. The middle panel shows staining of the nuclei with DAPI. A merge of the two stainings is shown on the right. 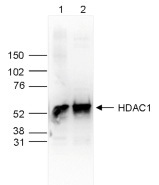 Diagenode strongly recommends using this:	HDAC1 polyclonal antibody - replaced by the reference C15410325 (Diagenode Cat# C15410053 Lot# A21-001P). Click here to copy to clipboard. Citrullination of DNMT3A by PADI4 regulates its stability and controls DNA methylation. Dimethyl fumarate regulates histone deacetylase expression in astrocytes. The histone demethylase Kdm3a is essential to progression through differentiation. HDAC1 Regulates Fear Extinction in Mice. Enhancer of Zeste 2 (EZH2) is up-regulated in malignant gliomas and in glioma stem-like cells. The core binding factor CBF negatively regulates skeletal muscle terminal differentiation. Functional connection between deimination and deacetylation of histones.